A contract is a verbal or written agreement between two parties binding them to the performance of the agreement by law. The law of contracts is a sub-branch of the law of obligation under the civil law. The law protects the rights and duties that arise in regard to the fulfillment of the duties of a contract. In order for a contract to be valid, it must abide by some premise like offer, acceptance, consideration, and mutual readiness to be bound by law. There is also the rule of eligibility to enter the law of contract. Sections of the society like minors, drunkards, mentally unstable person, etc. are not eligible to perform a contract and a contract with this category will automatically become void. The student of law has to compulsorily study the law of contracts; it is one of the most essential and the basic law that you study when enrolled into a law program. The subject can be difficult and confusing to study and on top of that, there are several law of contract assignments that are assigned to the students. This adds to the already high burden on the students. Therefore, we at EssayCorp provide the best contract law assignment help to the students in the US, UK, and Australia. We are an old company in the field of academic writing help, we have thousands of writers worldwide and it helps us deliver assignments to you more quickly and with much ease. We also provide several other services related to law and the various subjects in the domain of law. Apart from contract law assignment help, our services include homework help, thesis help, dissertation help, essay help, case study on law, book report, project report, etc. Over the years, we have gained a lot of faithful clients due to our commitment to providing high-quality content and in the specified time. Therefore, take the assistance of our writers in the contract law assignment help service provided to all the students worldwide. An offer is a promise to fulfill a particular task or in some cases not to act, this is done in return to a promise of something in exchange from the other party. If we take an example; a mechanic offers to repair a car of the car owner, the car owner promises to pay $50 for the service. Here, the mechanic’s offer to repair the car is conditioned that the owner pays $50 after the task, the owner’s offer is conditioned with the task that the mechanic repairs the car. In order for the contract to be valid, there must be an offer that comes with a condition. Our writers are lawyers and therefore, they can provide you with the best contract law assignment help service. There must be an acceptance to the offer in order for the contract to be valid. The acceptance must be according to the specifications of the offer. If the offer does not specify any particular specifics of the acceptance then a reasonable option according to the circumstance can be adopted. 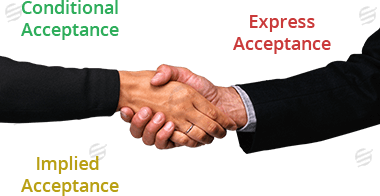 Offer and acceptance are the two primary elements of a contract. Acceptance of the contract happens when one party agrees to pay something in value for the acceptance. There are three types of acceptance, conditional acceptance, express acceptance, and implied acceptance. Elements of a contract law are essential and they are explained in detail by our writers in our contract law assignment help service. This is also a very important element for a contract to be valid. Both the parties involved in the contract must provide something of value to each other. It can be money or some type of service or product that is of value to the other party. In a contract, there is an exchange of considerations between the two parties. Let’s take the example of the mechanic and the car owner again. The mechanic offered to provide a service for $50 – the service and $50 are both considerations. $50 is the promise of consideration that the mechanic will receive after the completion of the service. And a repaired car is the consideration that the car owner received. Under the law of contracts, consideration and mutuality of obligation are two theories very closely related. According to the law, both the parties to the contract must fulfill their obligation and if one party fails to do so, then the contract will become void. Certain contracts provide one party of the contract with more power than the other. This party dictates the terms of fulfilling its obligation, whereas, the other party is required to oblige the contract. These types of contracts are declared null by most of the courts due to the circumstance of lack of mutuality of obligation. To learn more about the doctrine and the case studies, seek our contract law assignment help service. It is important that a person entering the contract must be competent and should possess the capacity to enter into a contract. A person can only enter into a contract if the court views him or her capable of understanding the law and can take care of their own benefit. The courts do not entertain contracts made with minor, mentally unsound, and intoxicated individuals. A minor can be defined as an individual between the ages of 18-21, depending on the jurisdiction of the state. A contract entered with the minor is at the minor’s discretion and if the minor chooses to disavow, the law would not hold him responsible or liable to the contract. It is not necessary that a contract must be in written form for it to be binding and valid by law. But, the legislation of several of the states have identified some contracts that needs to be in writing, while others that can be verbally accepted. In the parlance of law, this is called the law of frauds. This law was designed to be applied to four types of contracts. They are promise to marry, a promise to complete a task that is long term in nature and cannot be completed in the duration of a year, real estate agreements, and to pay another’s debt. To get a more insightful lesson on the topic, take the assistance of our competent writers in our contract law assignment help service. Law is a vast subject and not as easy as many of the other academic fields. The vastness of the subject is what makes it more convoluted and interesting at instances. A student of law has to deal with several law subjects simultaneously like the constitutional law, family law, law of torts, business law, and many other law subjects. And these subjects are inescapable if you want to attain a degree in law. Students often find it difficult to memorize the pile of information that is expected of them. The assignments in the subject only add to the burden of the student. They find it difficult to do multiple assignments on the range of subjects. Not to mention, the length of the assignments in this subject is also a reason for worry among the students. But, viewing the weight that an assignment carries in the final grading, the student must focus on the assignment or seek professional help for it. We at this company provide the best contract law assignment help service. We have many years of experience in this field and this makes us perfectly adept at doing your law of contract assignment. Protection of both the parties - The law helps protect the interest of both the parties. For example: A promised B to purchase from him 1000 chairs for a price of $50000 and they entered into a contract. After B manufactured the product, A backs off from the offer and B goes to court. B is protected by law since both A and B entered into a contract. Peace of mind - A contract provides a piece of mind to both the parties. You can be assured that if you fulfill the obligation of the other party, then your interests are protected by law. In our contract law assignment help, we provide you with a long list of benefits that are provided to the parties involved in a contract by the law of contract. Resolves dispute - A contract can help resolve the dispute regarding payment or the timely supply of goods and services. If a supplier has promised a business man to supply a certain quantity of sugarcane within a specified time limit and he backs down on the contract. The businessman bears a loss due to insufficient supply; then he can go to court and seek compensation. Professional subject matter experts for all the subjects with PhD and master's degree. Contract law is an important subject in the field of law. Most of the countries with a properly functioning judicial system have contract law as a system of governing contract between two people. Our law assignment experts do a proper analysis and collect the referencing before they incept the writing process. The follow all the recommendations made by you while attempting the assignment. Their qualification makes them the best choice to write your assignment. Therefore, come take the advantage of our writers in our contract law assignment help service.